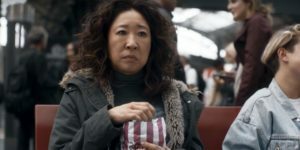 Killing Eve premieres its new season thirty seconds after the finale of the first, with Eve stabbing Villanelle in the stomach before chasing after the assassin, who has masterfully disappeared. This episode then follows the two leads as they deal with the aftermath of this bloody encounter. Eve just narrowly escapes with her life as three other assassins arrive at Villanelle’s flat and murder her neighbor. She then heads back to London, shaken and nervy by her ordeal. In a hilariously relatable scene, Eve piles various kinds of candy into a bag and just gobbles them up while waiting for her train at Gare du Nord. 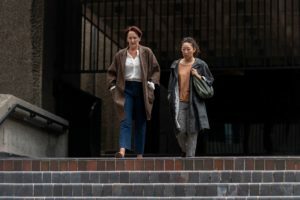 All through her journey back, she is nervous and twitchy, reeling from what she has just done and from the whole experience of meeting Villanelle. Her frantic energy leads to a stranger thinking she is a junkie, a notion at which she finds dark amusement and that leads her to laugh hysterically. But in a sense, she is an addict, as the various Killing Eve trailers have made out, and she will not be content until she crosses paths with Villanelle again. She finds her way home and begins cooking in a frenzy, surprising her perplexed husband. He knows something is going on but he does not question her. She continues to find peculiar ways of dealing with her experience, going so far as ordering a bunch of expensive windows. 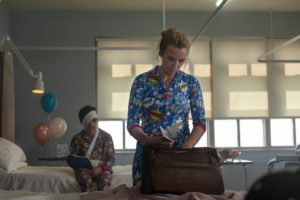 Meanwhile, Villanelle is as resourceful as ever, despite her injury, and manages to manipulate a taxi driver to bringing her to the hospital. As she recovers from her injury, she already plans her escape and while confined, makes a strange connection with the injured boy beside her, Gabriel. Having no one else with whom to interact, she is surprisingly honest to the boy, who finds her bizarre but also refreshing because of her frankness. At one point, he allows her to peek beneath the bandages on his face and she does not mask her reaction of disgust. Her description of his face (“You look like a pizza.”) is just one of those brilliantly hilarious but also inappropriate moments that make the morbid sense of humor of Killing Eve so unique. When Gabriel laments that he would rather die than live a life as a disfigured freak, Villanelle comforts him and then, grants his wish. This was a moment that would have been horrifying on another show comes across as somewhat acceptable on Killing Eve because, having listened to the conversation between them, there is an element of mercy to this killing, unlike the others Villanelle has carried out. In her limited capacity to do so, she seems to have some sympathy for the boy. It’s not a humane act, for sure, but believing that Villanelle is humane would be delusional on our part. Carolyn gets in touch with Eve and tells her about the note Nadia left for her in the prison. Carolyn remains as cryptic as ever as she leads Eve to a morgue run by an old friend of hers. They examine the body of a man who was believed to have died of a heart attack but who was clearly one of Villanelle’s victims. Nadia’s note has put them back on her trail. But Eve does not disclose that she met Villanelle in Paris though Carolyn does not seem to believe her. Spies and their secrets. Whether this was a wise decision remains to be seen. Villanelle makes her way to Calais, still dressed in Gabriel’s spare pajamas and climbs into the trunk of a car. She’s on her way to Eve and the chase has started again. The show is driven by these two women finding their way to each other and confronting the intense feelings they have for each other, whether or not they fully understand these.